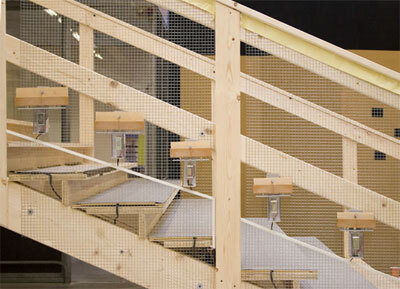 Tuned Stairs is a playful musical experience conceived for the Centre Pompidou in Paris. The installation turns the stairway into a musical instrument. Each step plays a xylophone note as the visitor steps on it. Visitors create their own musical composition according to how they go up or down the stairs. Tuned Stairs lets you make music with your feet. Tuned Stairs will be installed at the Centre Pompidou as part of the FABRICA: Les Yeux Ouverts exhibit coming up in October 2006. Stay tuned! Tuned Stairs stems from the tradition of "enhanced space" where technology is used to give an additional layer of meaning within a real space rather than creating a fictitious space or "virtual reality". It is a simple and elegant way to combine technology, mechanics and the movement of humans through a public space. Each step on the stair way has a floor sensor to which a solenoid and xylophone bar are connected. 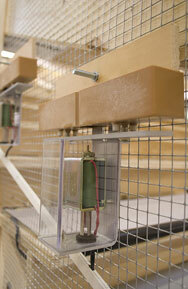 When someone treads on the sensor, the solenoid strikes the xylophone bar and makes it ring.